Waltham was an early center for the labor movement as well as a major contributor to the American Industrial Revolution. 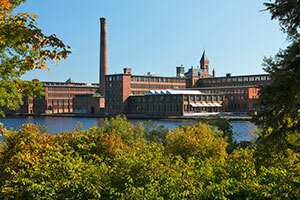 The original home of the Boston Manufacturing Company, the city was a prototype for 19th century industrial city planning, spawning what became known as the Waltham-Lowell system of labor and production. The city is now a center for research and higher education, home to Brandeis University and Bentley University. The population was 60,636 at the census in 2010. Waltham is commonly referred to as Watch City because of its association with the watch industry. Waltham Watch Company opened its factory in Waltham in 1854 and was the first company to make watches on an assembly line. It won the gold medal in 1876 at the Philadelphia Centennial Exposition. The company produced over 35 million watches, clocks and instruments before it closed in 1957.